An estimated 149 million NCAA March Madness men’s basketball brackets were filled out this year, with a collective $4.6 billion risked in the process — plus another $3.9 billion gambled, mostly illegally, on the contests. But what about women’s March Madness, which resumes on Friday with a Final Four that features Oregon taking on Baylor and the legendary UConn program facing Notre Dame in Tampa, Fla.? Those numbers are harder to find. So US Bets looked into to what extent — if at all — gambling on women’s college basketball, and women’s sports in general, is available in this brave new world in which eight states have adopted legal sports betting. It turns out that, yes, you can bet on these women’s basketball games, but not as readily as the men’s version. Kambi, which provides sports betting services to numerous U.S. partners, tells US Bets that it offered lines on a record 500-plus women’s hoops games in 2018-’19, with regular-season interest described as “decent.” The March Madness lines kicked off with the women’s Sweet 16. DraftKings, a partner of Kambi, takes those lines and even promoted women’s hoops action on Twitter. DraftKings also offers betting on women’s tennis, golf, soccer, and mixed martial arts. That includes futures bets on the women’s World Cup coming up in France this summer, notes DraftKings spokesman James Chisholm. The favored U.S. is listed at +275 there, followed by France at +350, Germany at +600, and England at +700. Looking for more action on the women’s Final Four? William Hill US tells US Bets that it has had lines for all of the March Madness women’s games, and had futures up even before the bracket was announced. Visitors to the William Hill online app, or to its sportsbooks at Monmouth Park and Ocean Resort and Tropicana in Atlantic City, can bet on the point spread, moneylines, and over/under point totals for the game, with first half or second half options available as well. FanDuel, which has its own popular app in addition to operating the sportsbook at the Meadowlands Racetrack, didn’t take action on regular-season NCAA women’s basketball games but has tournament lines. It also has women’s tennis betting, with plans for betting on LPGA majors and the upcoming WNBA season. William Hill got its sportsbook at Monmouth Park open in time to take WNBA bets last season. In this year’s women’s Final Four, unlike numerous seasons over the past decade, there is no prohibitive favorite. On the futures market, William Hill US lists three teams — Baylor (-130), Notre Dame (+260), and UConn (+460) — at odds below 5/1 to capture the national title. 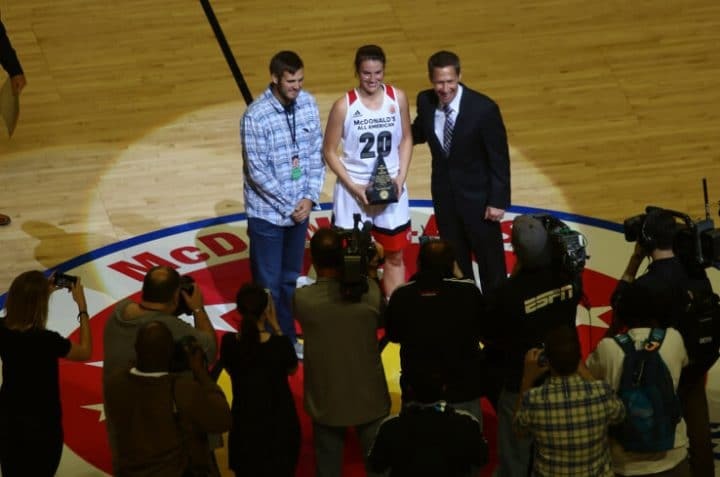 The fourth, Oregon (+1000), is led by Women’s Basketball Coaches Association Wade Trophy winner Sabrina Ionescu, an award given annually to the nation’s top player. Although Ionescu has emerged as a potential No. 1 overall pick in the WNBA Draft, it is still difficult to project her ceiling at the next level. Such prognostications were less challenging at the Final Four when transcendent players such as Maya Moore and Breanna Stewart of UConn and Brittney Griner of Baylor led their teams to undefeated seasons in their final collegiate appearance. When a perception exists among bettors that a handful of teams can win the title, sportsbooks are likely to draw more action for the Final Four, said Jay Rood, vice president of Race & Sports at MGM Resorts International. Moore won two national titles on undefeated Huskies teams, the last coming in 2010. Stewart, a four-time Most Outstanding Player recipient at the Final Four, won her fourth national title in 2016, an 82-51 win over Syracuse. Stewart’s team went 38-0 that season, and lost just five times in 156 games during her Huskies career. In most years, UConn’s proximity to Rhode Island’s legalized sportsbooks could leave officials at the Rhode Island Lottery with a considerable feeling of unease. As of Wednesday, though, William Hill US did not see a regional bias on UConn futures bets among customers in the Ocean State, according to Nick Bogdanovich, the company’s U.S. director of trading. Since Mississippi State guard Morgan Williams hit a buzzer beater in the 2017 Final Four to end the Huskies’ 111-game winning streak, UConn’s air of invincibility has faded somewhat. With a loss to the Irish tonight, UConn would miss the final for a third consecutive year. The Huskies entered the matchup with the Bulldogs two years ago as 21.5-point favorites (and Mississippi State was 20/1 on the moneyline). At the start of March Madness that year, UConn opened at -450 at the Westgate Superbook against the field to win the national title. Last August, the Rhode Island Lottery selected William Hill and IGT to serve as end-to-end sports betting service providers for Twin River Management Group’s sportsbooks at the Twin River and Tiverton casinos. Less than a year after legalizing sports betting, Rhode Island has taken a pounding on New England area favorites. During the Super Bowl, patrons at the two casinos placed more than 75% of bets with the spread on the Patriots. The fervent backing of the Patriots from local bettors led to a loss of $2.4 million for the two properties. In 34 seasons at UConn, coach Geno Auriemma has compiled a record of 1,062-138, winning at a clip of 88.5%. Auriemma has won 11 national titles, nine of them after 2000. Johnny Avello, director of sportsbook operations for DraftKings Sportsbook, credits UConn’s success for generating interest in women’s college basketball among bettors. While betting activity on the women’s tournament only represents a sliver of Nevada’s overall handle on March Madness, Avello noted that the handle for the women’s tournament has ticked up in recent years. Still, he projects that of Nevada’s estimated $300 million in handle on March Madness, only about 1% is on the women’s NCAA tournament. Avello, the former sportsbook director at the Wynn Las Vegas, said the highest bet he has ever accepted on a women’s basketball game falls within a range of $30,000-$40,000. A single wager has not approached that range for this year’s tournament, he added. It should be noted that not only does Avello set lines for every game in the women’s tourney, he said he’s been doing it for about a dozen years. One exotic wager that has gained popularity with Las Vegas bettors allows customers to wager on which team will be the first to reach 15 points in a game. Despite well-documented losses across the Strip during the North Carolina-Iona matchup on the men’s side, Rood credits the exotic for increased foot traffic during the tournament. At MGM, Notre Dame (-145 moneyline) opened as a 2.5-point favorite over UConn (+125 moneyline) on the pre-game market. But bettors don’t have to lay as much on the favorite in the race to 15 points. The odds are -120 on the Irish in the “First to 15” prop, while UConn is listed at even money. Baylor, the tournament’s top overall seed, is an overwhelming 7-point favorite over Oregon (ML +250). Led by senior center Kalani Brown, the Bears are -300 favorites on the moneyline. But again, the first-to-15 odds on the favorite are less steep. Baylor is -170, while Oregon is listed by MGM as a +150 underdog. “If anything, we are going to need Baylor to get the first 15 in the game,” Rood said. The propensity of underdogs to hit the 15-point threshold first during March Madness has prompted MGM to consider recalibrating some of the moneylines for the props in the 2020 tournament. Speaking of changes for 2020, one modest proposal suggesting adjusting the dates of women’s March Madness to give it a shot at the spotlight instead of being overshadowed by the men’s Final Four. As for New Jersey, as with the men’s tournament — where Seton Hall and Fairleigh Dickinson alums (raises hand) could not legally bet on their teams’ March Madness games — a pair of women’s March Madness games were bounced by state law. So backers of the Rutgers and Princeton women’s programs weren’t allowed to wager on what became first-round losses for each team. Additional reporting for this article was provided by Matt Rybaltowski.